High in fiber and rich in vitamin K.
The difference between rolled oats and steel cut oats include differences in taste and texture as well as in nutrition. Both types of oats are an all-around healthy and versatile food. They are a whole grain that offers vitamin K, dietary fiber, phosphorus, potassium, and folate among other vitamins and minerals. Additionally, they're vegetarian and can form a valuable part of any vegetarian meal plan due to their versatility. Oats can be eaten raw or cooked, made sweet or savory, and used plain or incorporated into other dishes, such as veggie burgers or veggie chili. People often think there is no difference between rolled oats and steel cut oats, but when you take a closer look you'll see a clear distinction. Just from looking, you can see rolled oats are a bit different from steel cut oats. 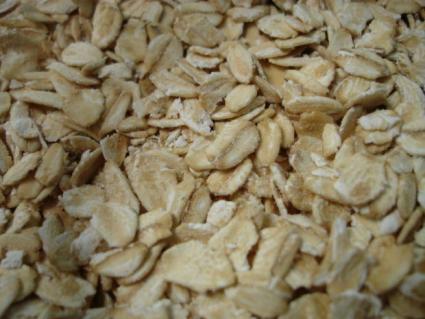 Rolled oats are lighter and flakier, and they appear to be pressed flat because they are; they're steamed and then rolled with heavy equipment to shorten their total cooking time. Steel cut oats appear thicker and rougher. They haven't been rolled, but they have been chopped with steel blades (hence their name). Because steel cut oats are thicker and heavier, their serving size is smaller by volume (but equal by weight). You'll get approximately the same total prepared amount of oats from an uncooked 1/2 cup of rolled oats and an uncooked 1/4 cup of steel cut oats. Rolled oats do expand when they cook, but not quite as much as steel cut oats. Steel cut oats have slightly more soluble fiber per serving than rolled oats, so they may be more effective at lowering blood pressure and cholesterol levels. Both types of oats have a good balance of soluble and insoluble fiber and have almost indistinguishable nutritional profiles otherwise. The greater amount of soluble fiber in steel cut oats means they take a bit longer to digest, so they may also make some people feel fuller for longer than traditional rolled oats. Steel cut oats are denser and thicker than rolled oats. There's a great disparity in total cooking time between quick oats, traditional rolled oats, and steel cut oats. Quick oats, which have been ground and cut up more finely than thicker rolled oats, are often designed to be microwaveable and can be zapped and ready to eat in just a couple of minutes. They may take a bit longer on the stovetop but are almost always ready to be served within five minutes. Thicker rolled oats take a while longer but are usually ready to serve within 10 to 15 minutes of being placed on the stovetop. Steel cut oats, on the other hand, are far thicker than even traditional rolled oats and require a longer cooking time. To make the oats soft and creamy enough to eat, they usually need to simmer on the stovetop for 35 to 50 minutes. It's certainly possible to eat them after shorter cook times of 15 to 20 minutes, but they'll be very chewy and won't have broken down as much. Steel cut oats can also be prepared overnight in a slow cooker or crock pot. Add at least twice as much water or liquid to the oats as you normally would, and cook them overnight or for at least four to five hours on LOW. Bigger batches will yield better, creamier results than smaller batches. For baking and in recipes, quick oats can often be used interchangeably with traditional rolled oats, but steel cut oats don't have the same texture and won't be successful in most recipes. Steel cut oats have a nuttier, grainier, and more rustic taste than traditional rolled oats, which are lighter and a bit blander. The greater creaminess of rolled oats makes them a better complement to fruit and other stir-ins than steel cut oats. Steel cut oats tend to be very chewy, even if they've been thoroughly cooked. They take longer to grind up and eat, and they also take longer to digest. They're also thicker than rolled oats, so a finished batch may be denser and feel more substantial. Rolled oats are far more common than steel cut oats, and they tend to be a lot cheaper. Steel cut oats are most expensive in pre-sorted bins, boxes, and tins, but they become more affordable in bulk bins at health-food markets and large food stores.